Cisco’s investment plan shows that the Asian Silicon Valley project is not an empty promise, but a concrete plan to accommodate international firms, Tsai said during a visit to the Taoyuan office of the Asia Silicon Valley Development Agency. The president’s visit to the agency was part of a trip to highlight the efforts being made to develop the government’s “five plus two industrial innovation program” aimed at boosting the nation’s competitiveness. The “five plus two” program refers to seven development projects proposed by the government to transform the nation’s economic and industrial structures. The program includes projects related to an Asian Silicon Valley, as well as the biotech, green energy, aviation, smart machinery and defense industries. The production value of the nation’s Internet of Things (IoT) sector topped NT$900 billion (US$30.29 billion) last year, up 19 percent from a year earlier, Tsai said. Tsai said she has faith that the production value of the IoT sector would surpass NT$1 trillion this year. While Tsai did not disclose details about Cisco’s investment in Taoyuan, she said the US firm’s plan shows that the nation is moving in the right direction. “By joining forces with Cisco, Taiwanese partners are expected to build an IoT ecosystem,” Tsai said. She said other multinational giants, such as Alphabet Inc’s Google and Microsoft Corp, have also shown their support for the nation’s IoT industry. “When the whole world is upbeat about Taiwan’s economic future, people here have no reason to lose confidence in the local economy,” she said. In March, Google launched a “Smart Taiwan” initiative to work with government agencies, schools and businesses to foster more than 5,000 workers trained in artificial intelligence (AI) and more than 50,000 in digital marketing. Microsoft set up an IoT innovation center in Taiwan in 2016 and opened an AI research and development center earlier this year. Before visiting the agency, Tsai called on electric scooter manufacturer Gogoro Inc. Clad in a helmet, Tsai rode a Gogoro electric scooter at the company’s headquarters. Tsai said she was impressed by the scooter, adding that the nation is finding solutions to its air pollution problems by pursuing green energy development. 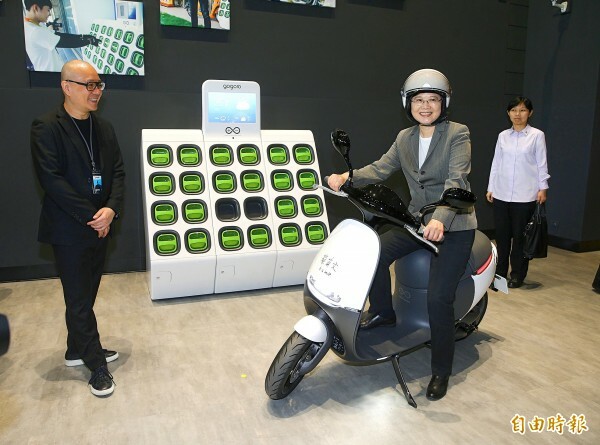 Gogoro cofounder and chief executive Horace Luke (陸學森) said his company has invested NT$8.4 billion since it was founded three years ago and would spend an additional NT$3.2 billion on battery swapping stations this year. Gogoro is also planning to target Southeast Asian and Indian markets, where sales of scooters are about 17 and 23 times Taiwan’s 1 million units a year respectively, he said.